Head coach Kingsley Jones says Taulupe Faletau is "very happy" at Newport Gwent Dragons and expects him to be playing for them this season. The Wales and British and Irish Lions number eight has been linked with Bath. But Wales head coach Warren Gatland suggested he would not sanction the 24-year-old leaving to play in England. "Toby was here on Friday, he's very happy here - there's no issues with that - and he's looking forward to playing for us," Jones said. Faletau has a year left on his Dragons contract and under the terms of the Rugby Services Agreement [RSA], signed between the Welsh Rugby Union and the regions, Gatland would need to approve any transfer. The first sticking point is that if Faletau was to join Bath his chances of playing for Wales could be restricted, because under the terms of the RSA, Gatland is limited in the number of players he can select who play their domestic rugby outside of Wales. Equally crucially would be the release of Faletau for Wales training camps and matches that fall outside World Rugby's official release window. "It's something that's been talked about with Warren Gatland... but I understand the rules of the game in the English league and it's not up to a club to give permission to release a player, it's governed by the PRL," Jones said. "The English clubs have signed an agreement that there's no [international] release outside the window accept for English players, that's what they paid the right for. "For me I can't see how anyone will be able to give permission to release any players, so if that's the stumbling block then that's that. " 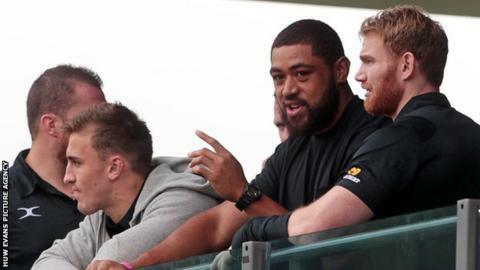 Faletau, who is an almost certainty to be selected for Wales' final 31-man World Cup squad on 31 August, has won 46 caps for Wales and one for the Lions in Australia in 2013.